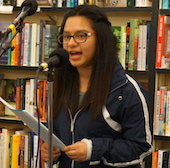 Every year, WITS hires writers to teach semester-long residencies at Portland high schools. At the end of each residency, WITS holds readings for each school in cafes and bookstores in their communities. At Gresham High School, students from Tina Kuchinski’s, Jim Gardenhire’s, Althea Mock, and Crystel Kinnee’s classes worked with WITS writers Serena Crawford and Matt Zrebski.